Space: the empty pallets needs empty aisle to be delivered at every converting machine side, often this spaces are not available or it would be better to keep them free for different use. Safety: the delivery of the empty pallets at every machine generates a forklift traffic inside the factory causing a potential danger for the machines operators. Costs: the organisation and the devices needed for the pallets management is a cost, for each converting line it is necessary, in fact , a suitable handling and a pallet dispencer to reduce the risk and the operators fatigue. 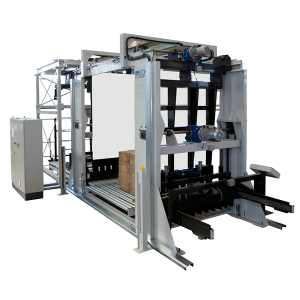 With the increase of the converting lines in the system the sum of the handling costs for each line is greater then the investment for a centralised pallet feeder. The solution by EDF Europe is “Feed pal”, the on the finished goods collection line just before the pallet press obtaining this way a centralised pallet management. The machine is made by a system of two squaring walls able to keep the load squared during the deposition, a lifting system to elevate the stack permitting this way the insertion of the empty pallet. The pallet are inserted trough a pusher that provides also the lateral centering. The deposition gap is very small granting to keep the stack quality for all the cycle long . The squaring walls incorporates a sleep sheet folding device in order not to damage the sleep sheet during the squaring cycle. The empty pallets are deposited on the pusher by a robot gripper able to pick up the proper pallet size from an empty pallet storage made by a set of aligned empty pallet stacks. 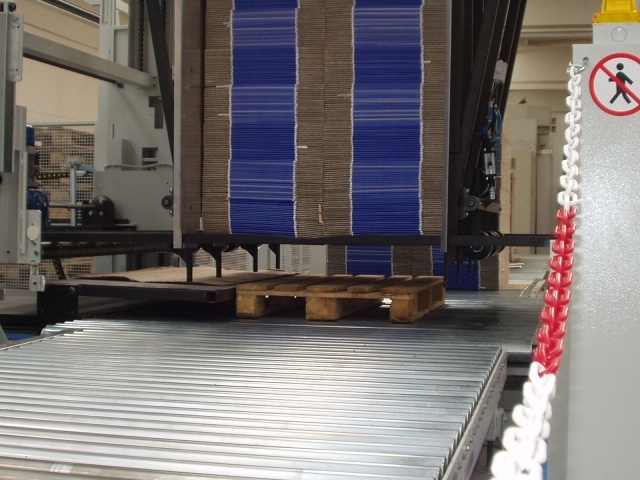 The gripper runs over the pallets stacks, the vertical movement is performed trough four flat belts on which the gripper is hangt. The gripper descent on the empty pallet stack up to the contact, at this point the closing cycle begins. The gripper fingers are fitted on elastic supports and permit to adapt the catching to different pallet sizes and shapes. Pick up errors are automatically recognised and signaled to the operator. 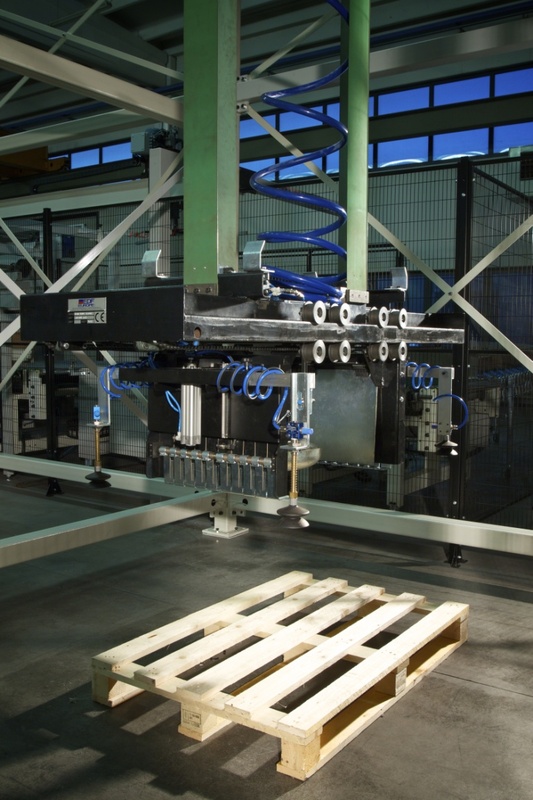 Several pallet pick up oint can be managed in a flexible way according to the different productions, it is possible for example to to have four different pallet sizes or to define that in two different pallet positions there is the same pallet size. In this case the machine pass automatically from a position to the other when a full stack has been finished. The gripper operation area is protected by fences and safety beams.